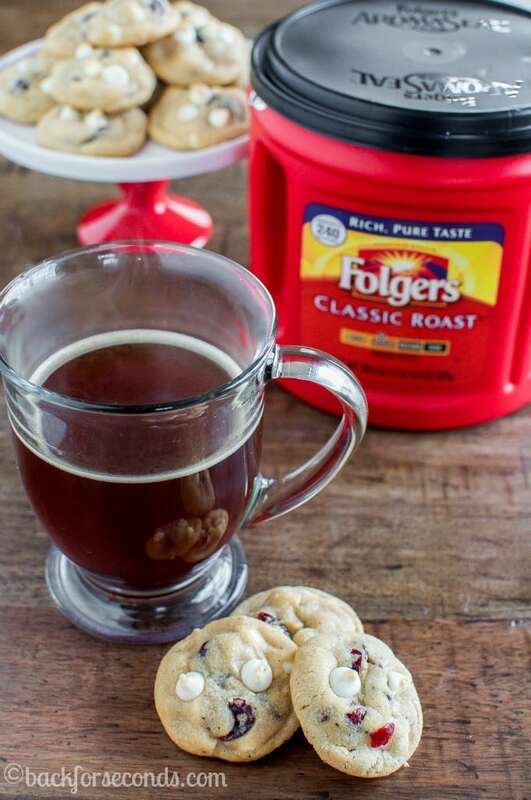 Folgers® coffee is the perfect companion these easy Christmas cookies! Thanks to Folgers® for sponsoring this post! 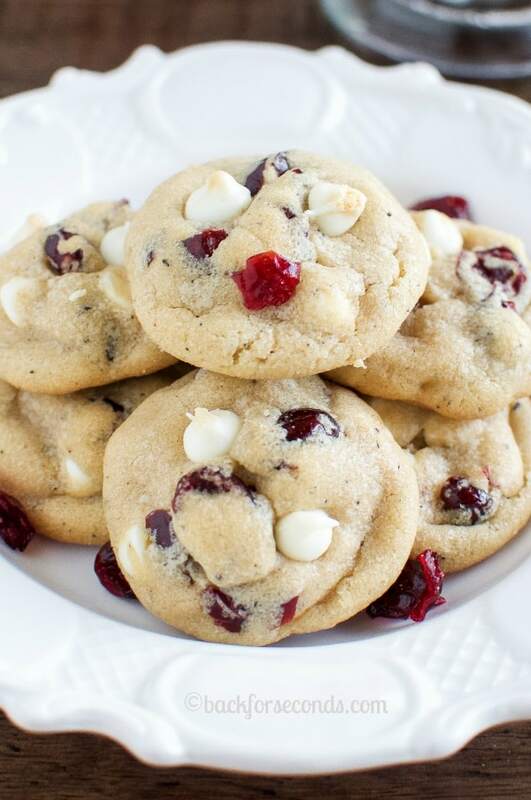 These are the Best White Chocolate Cranberry Cookies ever! Sweet and tart, and thick, soft, and chewy with a secret ingredient that makes them amazing!! It’s Christmas time, friends! That means we are going to need a lot of cookies and a lot of strong coffee to tackle everything on our to do lists. The decorating, the shopping, the kid’s Christmas plays, the present wrapping, etc., not to mention all of the regular everyday business…whew! Let’s get our energy up with some fabulous cookies and coffee! Remember those Folgers® commercials “The best part of waking up is Folgers in your cup”? I can’t help but sing it in my head whenever I see the iconic folgers classic roast that comes in the red can! This is the good stuff, made from Mountain Grown® beans, the world’s richest and most aromatic. Folgers Classic Roast Coffee has been The Best Part of Wakin’ Up™ for more than 150 years. Can you believe that? 150 years, wow! This has become my afternoon ritual most days: A cup (or two) of coffee, a cookie (or 3), a sleeping baby on my chest, and my laptop ready to go! Usually I am working on things for the blog, or I’m gathering ideas for these fun Parade articles, but lately I have been Christmas shopping too! Now that I have 5 little ones, going out to store after store to find the perfect gifts is just too much. So online shopping it is! 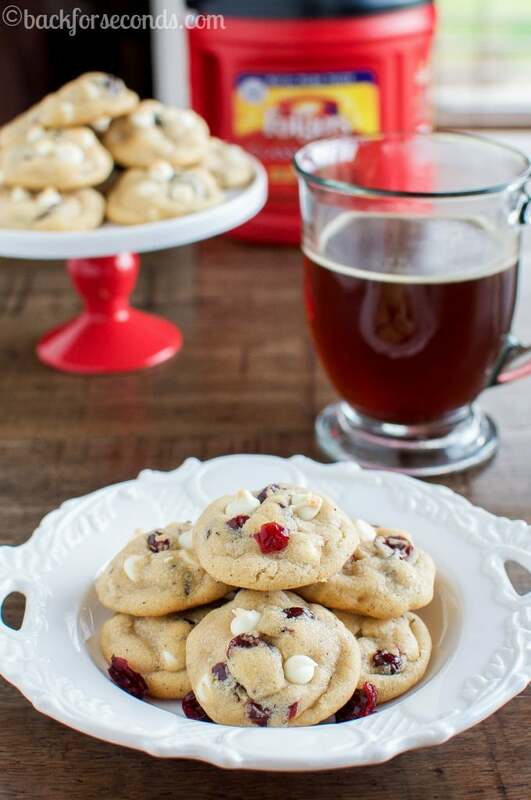 Nothing like peppermint mocha cream in my Folgers® coffee, Christmas music on Pandora, and these white chocolate cranberry cookies to get me in the holiday spirit! These cookies need to make an appearance on your cookie trays this year. They are made with brown butter – see all those tiny flecks in the cookies? That’s the heavenly flavor of brown butter! It really takes these to a new level of yum! Soft and chewy, tart and sweet. These are definitely a must make! So grab your Folgers® and let’s bake! Question about the brown butter, which I made last night: is it 1 cup brown butter or two sticks/1 cup butter converted to brown butter? There is some evaporation during the browning so it looks like I have less than a cup of the finished product. Thanks! Hi Marlene! You need 1 cup (2 sticks) butter that you will then brown. I’m sorry for the confusion, Hope you enjoy the cookies as much as we do! Thanks for the quick reply, Stephanie. That’s what I did, wanted to make sure I had the correct amount before baking the cookies. Hi! How many cookies does this recipe make? Thanks! About 4 dozen cookies. Enjoy! So, never having done this… How do you brown butter?